I am always looking for my next getaway. I love a nice long trip to a resort location, or a two week trip to Europe but I also enjoy short weekend getaways with my girlfriends. Don’t you ever just NEED to get away? I get that feeling all of the time. The problem is that even though I need to get away I don’t always have the time to schedule out a week or two away from the house. So when I get that feeling I plan a 48 hour quick getaway for a change of pace. This time I decided on a girls weekend in Salt Lake City. Luckily for me I can drive to Salt Lake. I got an idea (when I hit the wall and needed a break) for a Weekend in Salt Lake City with a group of my girlfriends. 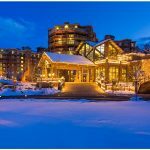 Where you stay is important – but it doesn’t have to break the bank. 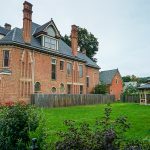 All I need is for it to be conveniently located, clean, large rooms, friendly staff, reasonably priced – what more could you ask for? We stayed at the new Courtyard Salt Lake City Downtown. Located in the perfect spot – close to many of the attractions (next door to the Vivint Smart Home Arena – think concerts and NBA) restaurants, shopping, and entertainment. There is a Trax station across the street and with it being in the FREE zone so you don’t have to pay to hop a ride if it is chilly outside. 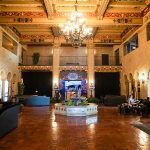 The hotel has a pool & hot tub, reasonably priced suites for more space, and a coffee shop INSIDE the hotel. I got a suite and the room was so large that we were able to set up some late night snacks and treats and had a late night visit with all 10 of the ladies hanging out until after 2 am. We had a ton of room for everyone with room to spare! After checking into the hotel and relaxing we headed to dinner. 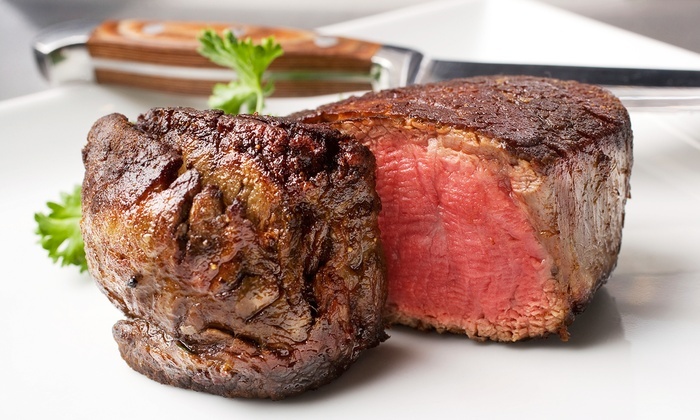 Christopher’s Steak House was within walking distance so it became the perfect dinner spot. They put us in a room by ourselves (10 ladies can get loud!) at a large round table – and all we had to do was ask for it! No extra price! It could not have been more perfect. The service was impeccable from the beginning. Hello! They are Zagat rated: EXCELLENT for a reason! Christopher’s serves only the highest quality all natural, locally sourced products. I had a hard time deciding what to eat so a couple of us decided to split so that we could try different things. I got a fillet mignon and traded half for the special of the night – fresh salmon with an avocado sauce. OMG. I don’t even like fish and I would go back and order that salmon over and over. We asked the waiters to just bring out a couple of their favorite sides for all of us to share. They brought out stuffed mushrooms, baked potatoes, ribs, creamed spinach, sweet potato fries and more. Everything was AMAZING. They are a perfect spot for a date night too. Plus, they usually have a Groupon so check that out before going! 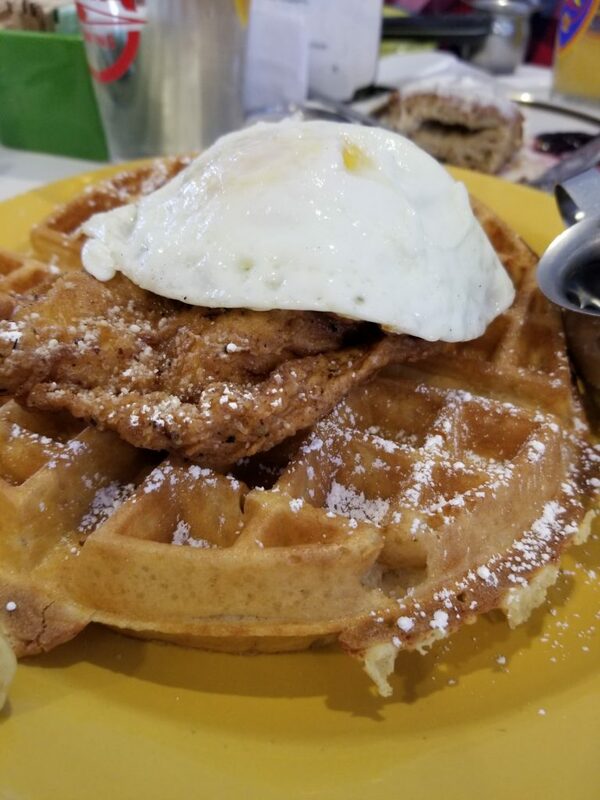 Brunch is the MOST IMPORTANT meal of the weekend. 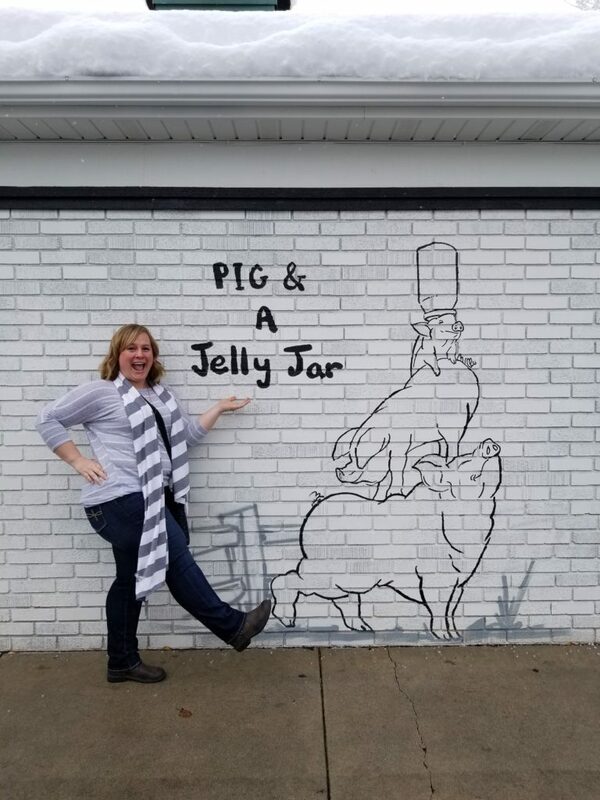 For brunch we tried Pig And A Jelly Jar. The place was bustling and for a good reason! We went to their newest and cutest location. I almost ripped this picture off the wall and took it home. I NEED this in my hallway bathroom! 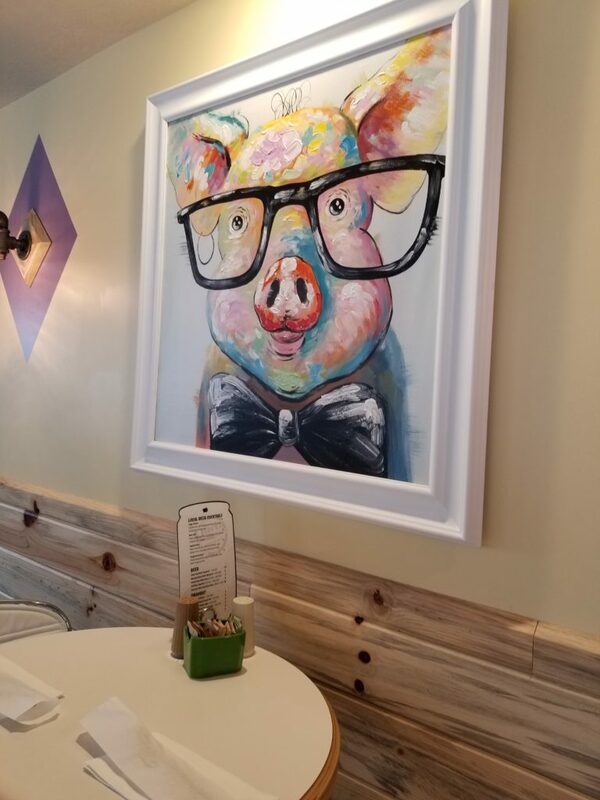 Pig uses fresh quality local ingredients as often as possible – and it shows! I ordered the chicken and waffles. I had heard that it was “the” thing to try and the reviews are spot on! If you like a little savory with your breakfast this is the go to item on the menu! BONUS for anyone that likes to Instagram their locations – they have the cutest photo wall outside of the building perfect for an individual or group photo opp. Located downtown City Creek Center is the center of one of the nation’s largest mixed-use downtown redevelopment projects. They have shopping, apartments, a gym, restaurants, and more! This unique shopping center features a retractable glass roof, water features – including indoor and outdoor fountains, a creek that runs through the property, walls with stone quarried in Utah where you can find fossils and trilobites, and HEATED floors. Yes, heated floors. You can leave your coat in the car and have less to lug around! It is the most unique shopping experience that I have had in a long time! 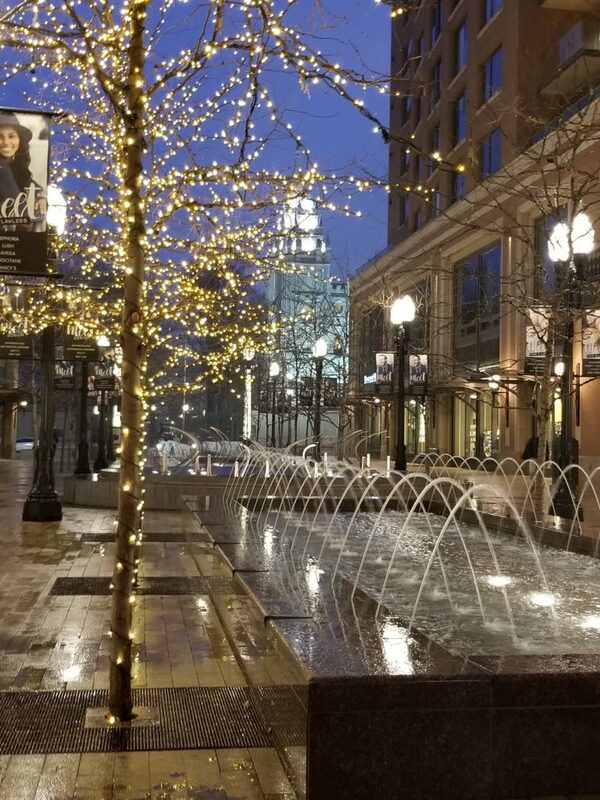 I could have (and did) spend hours at City Creek – and I am not a big shopper! There was just so much to see! I did not buy a lot (although I could have) but I did have a little fun! So now that you have eaten and shopped – what now? I’ll tell you! Have you done an escape room yet? Salt Lake has a ton of them and we found one within walking distance, LIVE Game Escape SLC! 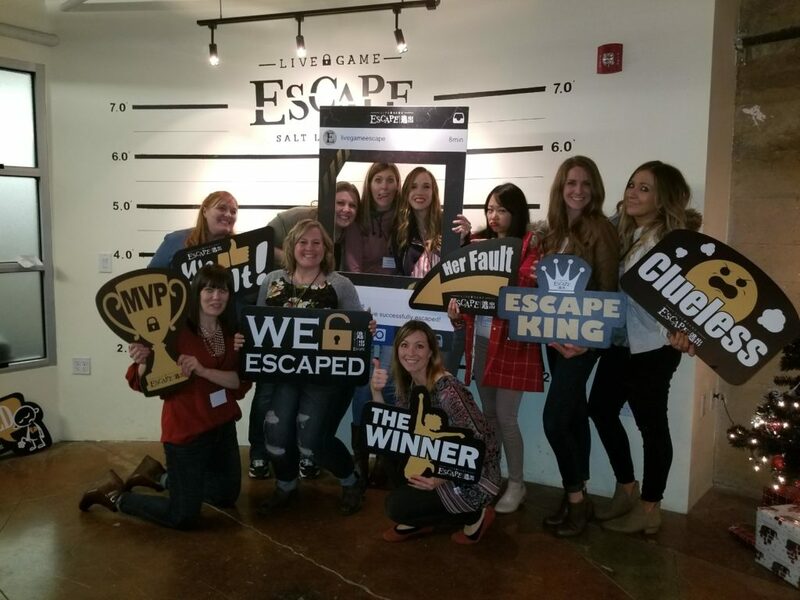 I have done escape rooms in the past so I knew that we were going to have a good time but some of the other ladies were nervous. The host puts your group in a room and you are given an hour time limit to find clues that will help you get out. This place had 3 different themed rooms. We split into 2 groups of five and raced to get out. My team tried the hardest room and it was challenging to say the least. You can get hints BUT if you think things through (or have a genius with you that thinks outside of the box) you can solve the mystery and escape without help. What was the outcome? We all escaped! Everyone enjoyed themselves and can’t wait to try another room! They usually have a Groupon out so check for those if you are planning a visit. 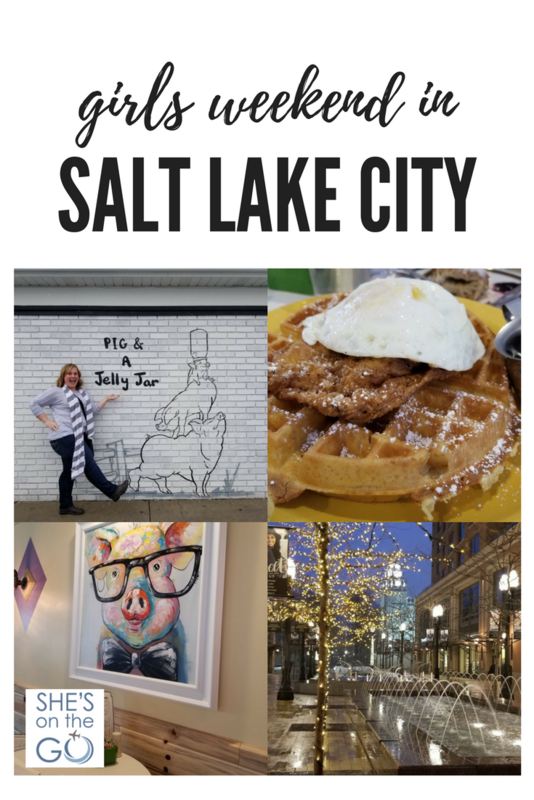 I hope you got some fun ideas of where to go, what to do, and where to eat for your next girls weekend to Salt Lake City. What else would you do on a weekend getaway?